Home Online Marketing What is content marketing and why do I need it? To begin with let’s answer the simple question of what is content marketing, actually? Marketing has evolved hugely in recent years. Back in the pre-internet days, all a company had to focus on was advertising in their local paper, sticking a few notices in shop windows and randomly dropping leaflets (or bumf, to give it its technical term) through the letterboxes of thousands of people and hoping for the best. Times have changed. Businesses now have a whole lot more to worry about – downside is more work to do, upside is you can be much more effective in reaching potential customers and encouraging them along the sales process. Unlike an advert in the local rag, content marketing is much deeper and richer. Think of it more as providing a service to your potential customers rather than forcing your sales pitch on them; you’re still pitching your services and products, it’s just a much more subtle (and effective) approach. 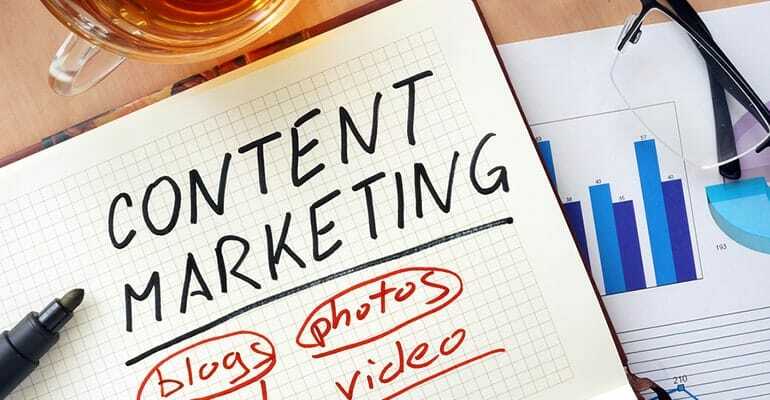 Content marketing can best be described as a strategic approach to the sharing and distribution of interesting, useful and relevant information. It’s also about targeting that information at the people who might be interested in what you’re selling, rather than the scatter-gun ‘bumf’ approach of years gone by. Quality content is really at the heart of any marketing strategy. You need it for social media interaction, for good SEO results, for public relations, Pay-Per-Click and, well, pretty much everything! Content can take the form of blogs, case studies, newsletters, e-guides, books, infographics, videos, webinars, tweets, Facebook posts, webinars, press releases, newspaper articles and so on. Having a definable content strategy is just one of the methods that you can use to encourage people along the sales process – and it mostly sits right at the bottom of that funnel, getting your potential customers interested in the first place. It’s difficult to measure and may take a while to bear fruit, but done well, it has a number of outcomes, both tangible and intangible. Take two businesses offering the same services – an electrician for example. One has a website that was last updated in 2008 when the original website was built, and that’s it. The other has a modern Mobile First website, with a blog or knowledge hub and a news section, plus a Linked In page, a Facebook page, Twitter and Instagram accounts and produces regular articles, videos and information (content) to share across all those channels. You may have also read about them on news websites and in trades publications, because the business is also aware of and looking out for PR opportunities. Which of those companies do you think you’re most likely to explore further? We’re all looking for information all the time. I might search for ‘where are the best places to visit in Birmingham’? ‘electricians in Sutton Coldfield’, ‘how can I treat my sprained ankle’ or ‘why do I need content marketing’ (ta-dah!). If you’re providing information on that subject, your customers are more likely to find (and hopefully choose) you. There’s nothing Google likes more than good high-quality content. You don’t even really have to worry about keywords anymore; those days are gone. If you’re providing regular, useful and engaging content that people are interested in, Google will reward you for it. If you’re regularly providing industry insight, thought analysis, latest news and useful information in your field that people like to share, you will begin to stand out. Do it consistently and you’ll become the ‘go-to’ business when people want to know something about your industry. You’re not providing content for the sake of it. The overall aim of course is to convert more leads into sales. Quality content can really help that process along. Having content out there means more traffic to your website. You might share a video snippet on Facebook that links to a blog on your website, which in turn links to a downloadable e-guide, which might include a free consultation offer, that leads to a new customer.